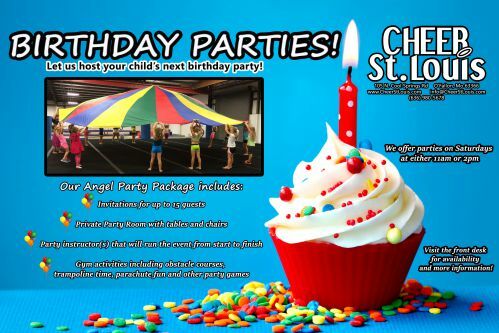 Price of this party package is $200 and includes 45 minutes of supervised activities in our air-conditioned gym and 45 minutes in our party room for up to 15 kids (additional kids extra). Private party room with tables and chairs. We allow access 30 minutes prior to party start time. Party instructor(s) that will run the event from start to finish. Gym activities including obstacle courses, trampoline time, parachute fun, and other party games. Cake, food, and/or drinks as desired. Gratuities are welcome for excellent party staff! We offer birthday parties on Saturday’s at either 11am or 2pm. Please call 636-980-5678 or visit the front desk for open dates and times. Visit our website or come by the front desk to fill out a Birthday Party Registration form and pay your deposit to hold the date and time. Our party coordinator will ensure all the details are taken care of and that your child has a great party! There is a non-refundable $50 deposit due upon scheduling the party. The $50 will be applied to the total amount due at the end of the party. Our party coordinator will call you a week prior to the party to get the final guest count.